Automated messaging systems keep riders safe, and can deliver directional, instructional and advertising messages too. Hotel safety is a paramount concern today. Just imagine that it is 2AM; a couple that has been out on the town gets on your hotel’s escalator. She is tired and exhaustedly leans on the escalator handrail. Her chiffon dress is dangerously close to being caught. The night is saved when our automated messaging system delivers a safety message informing her to stay clear of the sides of the escalator and to hold the handrail. It is just the nudge she needs to see that leaning in the chiffon dress is not the wisest move. She stands exits safely and never knows how close she came to disaster. You have kept your guest safe; she avoided injury and you a possible litigation nightmare. Sound View Electronics automated messaging systems for escalators and walkways can also be used to direct and instruct guests. 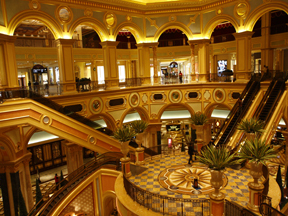 Many guests may leave the escalator and ask where the pool or restaurant is. Our automated message system can inform your guests where they can find the pool or restaurant (i.e. by exiting left going down the hall to the second door on the right) these messages save your guest time and the hassle of finding someone to ask directions from. You may also want to remind your guests to use their room key card to gain access to the hotel after midnight and business travelers that they can print their boarding pass for their early flight in the business center. The options to communicate with riders are as vast as your needs. 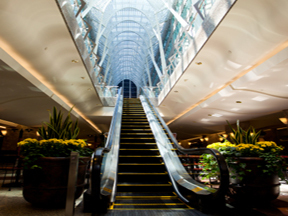 Automated messaging systems on hotel escalators can direct customers to your restaurants and other hotel services. Here is a great idea for hotel advertising. As a hotel operator, you would like it if more guests ate breakfast at your restaurant. A soft, suggestive announcement about your breakfast buffet special can drive more patrons to breakfast. Or perhaps you want to run hotel ads informing guests of your upcoming Valentine’s Day specials…we can help you do that too. Do you have a need for an automated message to be delivered to your guests that we haven’t mentioned? We are expert problem solvers and would be glad to discuss and develop a custom solution for your specific needs. Our glass panel speakers fit in beautifully with your glass escalators or walkways. Our speakers come in six different configurations and we make the enclosures in stainless steel or brass. Sound View Electronics amplification systems can drive 6, 8, 12 or more speakers to fit your specific needs. You can have one or two message sequences play on each escalator or walkway in any language needed, improving moving walkway and escalator safety for customers of all backgrounds. We can change the messages via a USB flashdrive, SD card via the Internet.